The Vikings will start playing their home games at U.S. Bank Stadium in 2016. 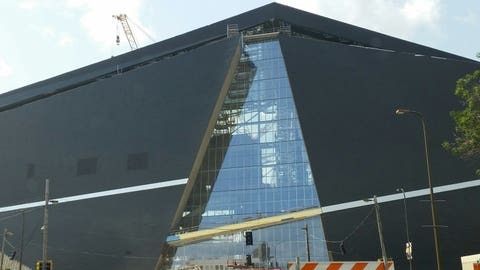 The Minnesota Vikings are close to completing their new home. Over the weekend, the team announced that the construction of U.S. Bank Stadium, which is slated to host home games starting next season, is 75 percent complete. At this morning’s MSFA monthly board meeting, Mortenson Construction announced that the stadium’s progress has hit the 75% completion mark. Since ground was broken in December 2013, $640 million worth of work has gone into the site. There are currently 1,400 workers on site, the highest number the construction site will see. The crane that was used to place the structural steel on the on the south side of the roof has been disassembled and removed from the site, making way for full enclosure in the immediate future. The U.S. Bank Stadium logo is currently going up on the exterior stadium’s north side as well as on the roof on the same side. The retractable seating elements will soon begin installation with the entire retractable seating complete at the end of March. The Vikings, who currently play home games at the University of Minnesota’s TCF Bank Stadium, will be spoiled by one of the NFL’s most advanced venues when this project is complete. Among the many state-of-the-art amenities, U.S. Bank Stadium recently announced that it will feature one-of-a-kind LED lighting designed to improve fan experience. Minnesota is pushing every technological boundary in the construction of this stadium, as the Vikings try to create the ultimate setting for enjoying a pro football game.